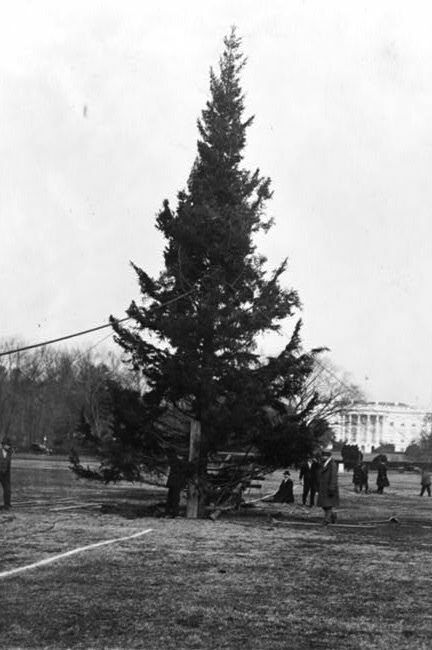 “First National Christmas Tree and Lighting Ceremony,” Histories of the National Mall, accessed April 23, 2019, http://mallhistory.org/items/show/524. On December 24, 1923, President Calvin Coolidge lit the first National Christmas Tree on the grounds of the Ellipse. Community volunteers and civic leaders, worked together with local schools and the Society of Electrical Development to organize the celebration. The tree came from President Coolidge's home state of Vermont and was covered with 2,500 electric lights. After the tree lighting, thousands of Washingtonians and visitors sang Christmas carols accompanied by a US Marine Band quartet at the White House. African American residents held their own ceremony at the tree starting just after midnight on Christmas morning. Library of Congress Prints and Photographs Division View original.